From Marx’s materialistic perspective, religion serves to mystify the real relations between men and inanimate objects. In reality, according to Marx, nature is an impersonal force which imposes limitations on man’s capacity to act, but nature can be understood scientifically and manipulated rationally, via technology, potentially for the benefit of man-kind. However, through religion, humans project personal characteristics onto nature: they invent gods which they believe have control over nature, and come to believe that the way to manipulate nature is to appeal to these gods through ritual or sacrifice. ‘Religion is the sigh of the oppressed creature, the sentiment of a heartless world and the soul of soulless conditions. it is the opium of the people’. The promise of an afterlife gives people something to look forwards to. It is easier to put up with misery now if you believe you have a life of ‘eternal bliss’ to look forward to after death. Religion makes a virtue out of suffering – making it appear as if the poor are more ‘Godly’ than the rich. One of the best illustrations of this is the line in the bible: ‘It is easier for a camel to pass through the eye of a needle than for a rich man to enter the Kingdom of heaven. Religion can offer hope of supernatural intervention to solve problems on earth: this makes it pointless for humans to try to do anything significant to help improve their current conditions. Such lines make social inequalities seem as if they are ‘God’s will’ an thus unchangeable. From the Marxist Perspective, religion does not only ameliorate the sufferings of life, it also effectively creates false consciousness. 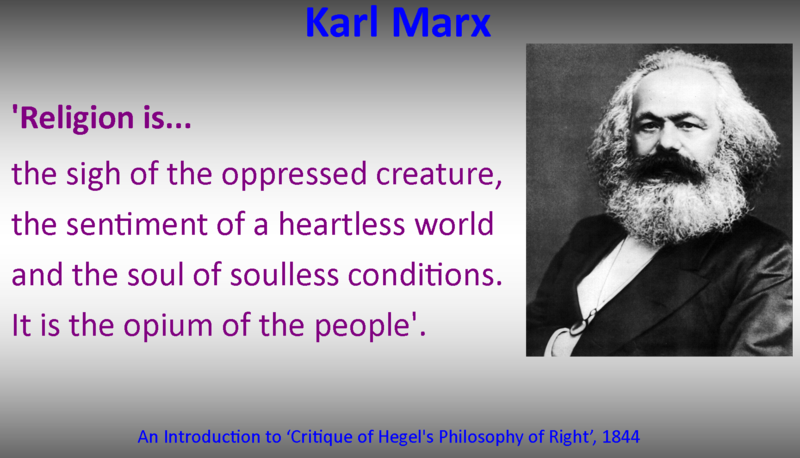 Marx believed that the ‘objective’ truth was that the proletariat (i.e. most people) suffer deprivations because of their exploitation by the Bourgeois (namely the extraction of surplus value empowers the minority Bourgeois class and leaves the majority of the proletariat with insufficient money to lead a decent quality of life), however, people fail to realise this because religion teaches them that all of the misery in life is God’s will. ‘In religion people make their empirical world into an entity that is only conceived, imagined, that confronts them as something foreign’. ‘The parson has ever gone hand in hand with the landlord’. This was especially true in feudal England when the landed classes’ decisions were frequently legitimated be religious decree: as Marx and Engels saw it, the bourgeois and the church supported one another: the former generously funded the later, and church legitimated social inequality, thus maintaining the established social order. Religion is only necessary under exploitative systems where the majority of men do not control the conditions under which they labour, under systems where men work for someone else rather than for themselves: in such systems, religious doctrines which teach that ‘you are insignificant in the eyes of gods/ the supernatural’ make sense, and serve a useful function for those who are in control of and who benefit from said exploitation. Under communism, where man controls the conditions of his labour, he is essentially ‘for himself’, and thus will have no need of religion. Under communism, where reality is ‘fair’ religion will not be required, and so will simply whither away. The original text where Marx’s ‘opium’ line first appeared in 1844. There is a considerable body of historical evidence which supports the Marxist view of the role of religion in society: for example the traditional caste system in India was supported by Hindu religious believes (in reincarnation for example); and in Medieval Europe Kings ruled by the ‘divine right of God’. Possibly the most ‘extreme’ example, however, is in ancient the ancient Egyptian belief which held that Pharaohs were both men and gods at the same time. A more recent example, drawn from the USA, lies in the support that Republican politicians have enjoyed from the ‘New Christian Right’ who, according to Steve Bruce (1988), support ‘a more aggressive anti-communist foreign policy, more military spending, less welfare spending and fewer restraints on enterprise’. The new Christian right have persistently supported more right wing (neo) liberal candidates – such as Ronald Regan in 1984 and George Bush in 2004 – when the later was elected, an exit poll found that two thirds of voters who attended church more than once a week had voted for him. While it might be debatable how successful the religious right in the USA are in getting their candidates elected to political power, what does seem clear is that they do tend to support more economically powerful sectors of the political elite, suggesting support for the Marxist view of religion. Firstly, it is clear that religion does not always prevent social change by creating false class consciousness. There are plenty of examples of where oppressed groups have used religion to attempt (whether successful or not is moot here) to bring about social change, as we will see in the neo-Marxist perspective on religion. Secondly, religion still exists where there is (arguably) no oppression: the USSR communist state placed limits on the practice of religion, including banning religious instruction to children, however, religious belief remained stronger in the 20th century in Russia and Eastern Europe than it did in the capitalist west. Thirdly, and building on the previous point: just because religion can be used as a tool of manipulation and oppression, this does not explain its existence: religion seems to be more or less universal in all societies, so it is likely that it fulfills other individual and social needs, possibly in a more positive way as suggested by Functionalist theorists such as Durkheim, Malinowski, and Parsons. Adapted from Haralmabos and Holborn (2008) Sociology Themes and Perspectives, 7th Edition, Collins. In case you’ve been living in the dark-ages and missed it (like me) Hunted is a T.V. show in which ordinary individuals take on the role of fugitives on the run from ‘Hunters’ who take on the role of agents of the state (think of MI6 meets special ops). The latest C4 series kick-started with 9 individuals (although 6 of them paired-up, so really just 6 targets) bailing from a van in Manchester city center, and then spreading out to the four corners of the UK. If they can evade the Hunters for 25 days, the survivors each get a share of £100K. The ‘Hunters’ consist of some serious (and not particularly pleasant, although that may be dramatic license) intelligence professionals based in London HQ, who steer a number of ground-teams, some of whom are the ‘Hunters’ who are empowered to ‘arrest’ the fugitives, and some of whom are just covert surveillance operatives who aren’t allowed to reveal their identity. I must say, I caught the second half of episode 5/6 entirely accidentally during a Thursday evening channel hopping session last week, and enjoyed it so much I binged-watch the entire series over the next couple of days. At time of writing (5 episodes in to a series of 6), 4 out of the 6 targets have been captured by the Hunters using a variety of surveillance and closure tactics, and 3 remain: because one original pairing has split up. We may as well start with the obvious – YES the state has deeply-penetrating powers of surveillance. Phone taps – some of the fugitives use ‘burner phones’ to avoid detection, the problem being that as soon as they ring someone in their network, the Hunters have that burner phone on record and can tap it. Analysis of the fugitives’ social media profiles. Network analysis – this actually proves to be the most important aspect of tracking people down, simply analyzing the network of family and friends and focusing surveillance on these is what typically leads the ground teams to the fugitives. The Hunters have access to the fugitives’ phone and social media records, which clearly show the fugitives’ recent life-histories mapped out, and, crucially for most of the captures, the ‘densest’ lines of communication within those networks. With some of the individual fugitives, we really get to see the ‘strength of weak ties’ – especially the guy who is ‘Deputy Mayor of Sheffield’, whose network is huge. However, there is one person who stands out, and this is what gets him caught in the end. With the three pairs, what is further apparent is that all of them have quite different personal networks, despite being very close to each-other, which really goes to show to complexity of networks in contemporary Britain. The Network Analysis which ultimately led to the capture of the Deputy Mayor of Sheffield. Interestingly, MOST of the fugitives return to their home turf, and most to the support of their local friends and families – so it is clearly not correct to say that our networks are free-floating and virtual – our meaningful relationships are still very grounded. Finally – it gives us a nice insight into Multi-cultural Britain! I don’t know if it was a deliberate ploy of this year’s recruiters to demonstrate British multiculturalism, but it’s very interesting to note that 2/6 targets were African Immigrants, all from different countries: it’s actually quite rare to get such an in-depth insight into the back-stories of black-Britons, quite a nice escape from the usual, generalized tokenistic representations we get in ‘black history month’ for example. Very Finally – what I probably find most interesting about the show (although this might just be me) is that it does put you on the side of the fugitives… you do want them to win, and this is a potentially disruptive show… it wakes you up to the awesome surveillance powers of the State: the extent to which they can penetrate into our daily lives, especially if we leave an electronic trace… although it might also be performing a subtle ‘social control function’ by sending out the message that…. The State COULD be watching you. I think the addition #Hunted really needs is a ‘how to avoid state-surveillance’ guide… and what would my strategy be? Actually I’m not going to say, I fancy a pop at this for season 4! Changes in the way we interact and communicate lead to changes in the way we govern ourselves and just as with the invention of the printing press resulting in the evolution of copyright and libel laws, so the emergence of big data will result in new laws to govern the new ways in which this information is collect, analysed and utilized. In this final chapter of the main section of Viktor Mayer-Schonberger and Kenneth Cukier’s (2017) ‘Big Data’: The Essential Guide to Life and Learning in the Age of Insight – the authors suggest four ways in which we might control the use of Big Data in the coming years…. Firstly, Crozier suggests we will need to move from ‘privacy by consent’ to ‘privacy by accountability. Because old privacy laws by consent don’t work in the big data age (See here for why), we will effectively have to trust companies to make informed judgments about the risks of re-purposing the data they hold. If they deem there to be an element of risk of harm to people, they may have to administer a second round of ‘consent of use’, if the risk is very small, they can just go ahead and use it. If is also possible to deliberately blur data so that it becomes fuzzy and you cannot see individuals in it – so you can set analytical programmes to return aggregate results only -an approach known as differential privacy. Comment: NB – this sounds dubious – we just trust companies more….the problem here being that we can only really trust them to do one thing – put their profits before everything else, including people’s privacy rights. Secondly, we will also need to ensure that we do not judge people based on propensity by aggregate. In the big data era of justice, we need to hold people account for their individual actions – i.e. for what they have actually done as individuals, rather than what the big data says people like them are likely to do. Thirdly (which stems from the problem that big data can be something of a ‘black box’ – that is to say the number of variables which go into making up predictions and the algorithms which calculate them defy ordinary human understanding) – we will need a new series of experts called algorithmists to be on hand to analyse big data findings if and when individuals feel wronged by them. Crozier argues that these will take a ‘vow of impartiality’ in monitoring and reviewing the accuracy of big data predictions, and sees a role for both internal and external algorithmists. Comment: this doesn’t half sound like something August Comte, the founding father of Positivism, would say! Crozier argues this is just the same as new specialists emerging in law, medicine and computer security as these field developed in complexity. Fourthy and finally, Crozier suggests we will need to develop some sort of new anti-trust laws to ensure that one company does not come to have a monopoly on data. I detect a distinct pro-market tone in the authors’ analysis of big data – basically we trust companies to use it (but avoid monopoly power), but we mistrust governments – precisely what you’d expect from the Silicon Valley set! In the above scene, John Anderton (played by Tom Cruise) is the chief of police of a special Washington D.C. ‘pre-crime’ unit – in which predictions are so accurate that people are arrested before they have committed a crime. In the movie, predictions are actually made on the basis of some ‘psychic’ beings who are biogenically networked into the police’s systems, but this aside, the above movie acts as a great starting point for the topic of surveillance and pre-crime. You can simply show the clip, and then get students to think about where in society authorities restrain or restrict people based on ‘big data’ which is a form of surveillance. Students should be able to think of a few examples at least, tied into the topic of ‘actuarial crime control‘.